I recently had the opportunity to sample one of Katz Gluten Free's newest products - gluten free hamburger buns! They were extremely tasty! My favorite thing about them was that unlike other gluten free hamburger buns, these didn't fall apart while you assembled your sandwich or even while eating it! These gluten free hamburger buns are made from a combination of white rice, tapioca, corn, arrowroot, potato, and soy flour. They will be a great addition to any summer BBQ - just throw your hamburger or veggie burger on it and enjoy! You can purchase this product at your local health food store or by visiting www.KatzGlutenFree.com. For a pack of 4 hamburger buns, it will cost you $4.99. And if you spend over $30, shipping is free! If you would like to enter a contest to receive a dozen gluten free hamburger buns directly from Katz Gluten Free, please send an email to me at MsCeliacSays@gmail.com with "Katz Gluten Free Giveaway" in the subject line. Make sure to include your name, address, and phone number in the body of the email! All entries will be accepted until midnight (EST) on Sunday, March 6th, 2011. The winner will be announced on Monday, March 7, 2011. Have you had a chance to try Elisabeth Hasselbeck's High Protein Nogii bars yet? If not, you're missing out! I sampled and reviewed them last month and they were delicious! Last month, I was also lucky enough to sample the Super Protein Nogii bars! These bars were created by The View co-host in collaboration with her husband, Tim Hasselbeck, ESPN NFL Analyst and former NFL Quarterback! I found them to be just as delicious as the original Nogii bars. They are about twice the size with a similar flavor - Chocolate Peanut Butter Caramel Crisp! And yes, they are also gluten free! They contain a whopping 30 grams of protein and are an ideal balance of protein, fats, and carbs. These nutritious bars also contain no trans fats, hydrogenated oils, or high fructose corn syrup. Super Protein Nogii bars will also provide you with 15% of your daily serving of Calcium and Iron! All Nogii products are being manufactured in a facility approved and certified by the stringent testing of the Gluten Free Certification Organization (GFCO). To purchase the Super Protein Nogii bars, visit your local Smoothie King or you can also buy them online at Ms. Celiac's Market! Nogii products will also be releasing a kid's gluten free and nut free bar in the near future! For more information, please visit www.nogiidiet.com. Traveling on a gluten free diet can be extremely difficult! Add to that traveling to a country in which there is a language barrier. At times, it can be close to impossible to eat out safely on a gluten free diet. However, GlutenFreeTravelSite.com, makes the travel experience easier. You can search for Gluten Free Restaurants, Resorts, Hotels, Cruises, Grocery Stores, and Colleges by city or zip code or you can click on one of the 9 regions listed (United States, Canada, Europe, Caribbean, Asia, Latin America, Africa, Australia/New Zealand/Pacific Islands, and Middle East) and search for a specific location within that region. If you want to contribute to the site, you can do that too by submitting your own review! Every month, the reviewer of the most useful and detailed review is featured in the "Featured Review of the Month" section. The winner will receive 4 Triumph Dining Restaurant Dining Cards including American, Chinese, Italian, and Mexican Cuisines. There is also a section of the site that is dedicated to posting gluten-free restaurant menus for you to browse through plus there is a section filled with an assortment of gluten free travel resources including United States -based and Global Celiac Associations, Travel Agencies, Hotels, Restaurants Guides, etc. I would also recommend browsing through the site to discover new gluten free restaurants and stores near where you live. I discovered quite a few places I had never heard of nearby! 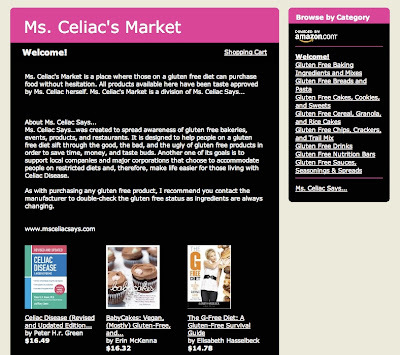 I created Ms. Celiac's Market through Amazon Marketplace in February 2009 soon after starting up this site in January 2009. 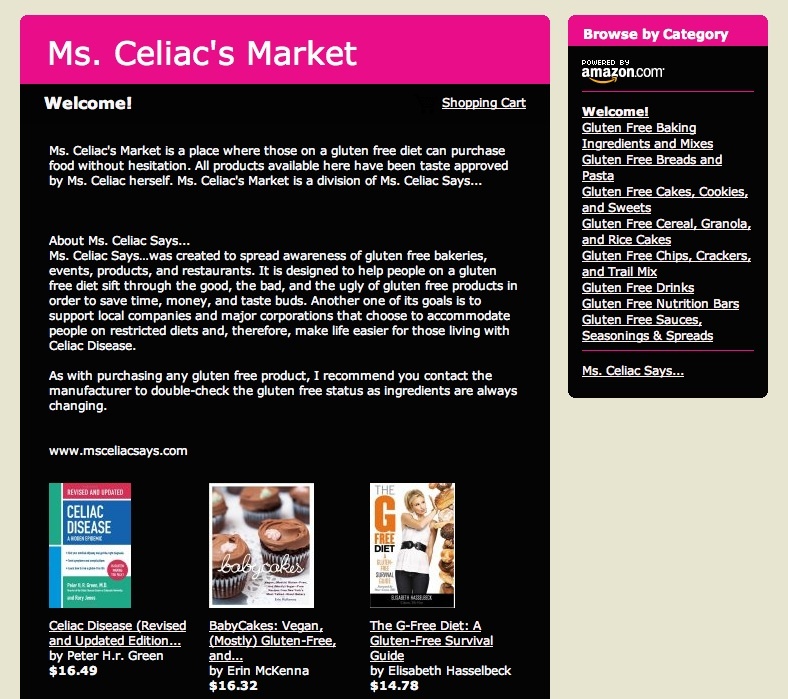 From the advice and feedback received, Ms. Celiac's Market has undergone many changes since that time. And as always, I appreciate any of your feedback! Ms. Celiac's Market will constantly be updating as we discover new and better products! So make sure to check us out often! I've been trying to find a chip that I could dip in salsa or guacamole that was both gluten free and free of corn! It's a more difficult task than you may think. Even rice-based chips contain corn! However, I recently discovered Beanitos! Beanitos are gluten free and corn free! They are high in fiber, contain 4 grams of protein, 1200 mg of Omega 3s and are certified as a low glycemic snack! I have sampled both the Black Bean and Pinto Bean so far. The Black Bean is currently my favorite! Beanitos are available at health food stores throughout the United States and Canada. You may also purchase them at Ms. Celiac's Market! For more information, visit them at www.beanitos.com or follow them on Twitter and/or Facebook. Still trying to find a perfect gluten free Valentine's Day gift? Here are some last minute ideas for you! Another great idea, is getting a gluten free cake from Pamela's Products! They produce an assortment of cheesecakes and a chocolate cake that you can find at your local health food store. Every one I have tried so far is amazing and I'm not usually even a fan of cheesecake! To read about them click here: Bring Out The Cake! Still not sure what to get? Check out some of my previous Valentine's Day articles from years past! Here's The Perfect Valentine's Day Gift! Looking for a Gluten Free Valentine's Day Gift? Phil Keoghan, host of the Amazing Race, has created an energy bar called NOW. NOW stands for No Opportunity Wasted! This is an all natural high protein bar made with gluten free rolled oats, peanuts & caramel, and Manuka honey. It contains 11 grams of Protein, 10% Iron, 6% Calcium, and 6 grams of Fiber. For more information, please visit www.NOWEnergyBar.com. You can purchase NOW Energy Bars at Ms. Celiac's Market. Spend a Gluten Free Evening with the Paul Taylor Dance Company! On Wednesday, March 2nd, 2011 the Paul Taylor Dance Company is hosting an event to benefit the Celiac Disease Center of Columbia University. Beginning at 5:45 pm, there will be a pre-performance reception with gluten free appetizers, pizza and sweets from Pala Pizza. The performance begins at 7 pm. Tickets range from $25 - $300. A portion of each ticket benefits the Celiac Disease Center if you mention code CDC at the box office or when calling CityTix or if you enter code 6586 when purchasing online. Searching for the perfect gluten free gift this Valentine's Day? Shabtai Gourmet offers a delicious assortment of gluten free chocolate baked goods! I recently sampled the Bon Bons, Chocolate Chip Biscotti, and Brownie Bites. All of these items were so scrumptious that it was difficult to believe they were gluten free! In addition to being gluten free, they are also casein free, lactose free, soy free, dairy free, corn free, peanut free and certified Kosher! The Bon Bons are even egg free and are a vegan snack! To order Shabtai Gourmet products, go to www.shabtai-gourmet.com. They currently offer $5.95 Flat Rate Shipping! So order as much as you would like! Good news for all of you that enjoy eating at Boston Market! By the end of this month, Boston Market's Poultry Gravy will be gluten free! Boston Market has locations throughout the United States. For more information on a location near you, please visit www.bostonmarket.com. Happy Groundhog's Day everyone! It seems that all of the groundhogs were unanimous this morning in not seeing their shadows and telling us that spring is just around the corner! Finally!!! In fact, Kettle Cuisine is the only gluten free brand of soup that I have found to be absolutely delicious and worth eating. For the past week, I have practically lived off of these soups as I recover from a bug. So, click on their ad and check them out! It's definitely worth it! And if you haven't yet, check out our other advertisers, Katz Gluten Free, to try out a delicious assortment of gluten free baked goods! 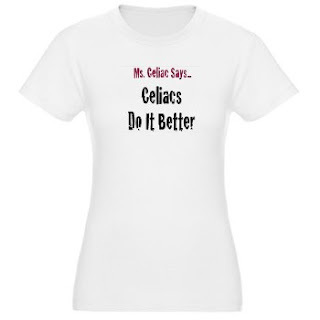 This year, Ms. Celiac Says..., has gotten off to a great start! We've had more visitors than ever before and Ms. Celiac's Market has really hit it off with the sale of Elisabeth Hasselbeck's Gluten Free nogii bars. If you haven't already bought some, check them out here: nogii bars. They are unbelievably delicious! You can check out the articles I wrote on them by clicking here and here. And an assortment of healthy recipes! Check them out here and here! Also, if you are planning a Super Bowl party or attending one, check out this article for some ideas on how to make it gluten free! Enjoy the month of February!